St John’s Wort is an erect perennial herb that can grow up to 1 metre tall. The simple oval leaves are arranged opposite each other and have no stalks. They have oil glands which show as small translucent spots when held against the light, giving a ‘perforated’ appearance. The bright yellow hermaphrodite flowers have five petals, are about 20 mm across, and are pollinated by insects. This plant is easily grown and it spreads through a network of creeping rhizomes. 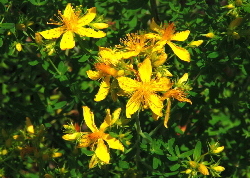 St John’s wort is native to Europe but it has reached North America where it has become a weed in some states. You would, therefore, need to check your local regulations before growing it in the USA. The leaves and flowers give up an unpleasant smell when crushed which was thought to keep evil spirits at bay. This plant is a symbol of St John the Baptist, as it flowers around 24 June, which is St John’s day or summer solstice; ‘wort’ is an original English name for plant. The fresh flowers produce a series of four different shades (green, maroon, brown and yellow) on wool; see Dean for details of the procedure. The plant tops give beige and brown. 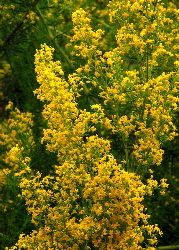 This is a low scrambling plant related to madder. The roots are finer than madder and produce paler colours due to the lower concentrations of dye. The flowers are very fragrant and smell of honey. They are reported to be a powerful aphrodisiac. In the past the dried plants were used to stuff mattresses. The flowers were used instead of rennet to coagulate the milk for making cheese. Another plant of the coffee family, which produces red from the roots. 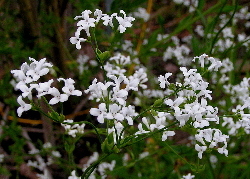 It grows to about 30 cm high and has beautiful white flowers.